He got the call for that fire in the middle of the night, around 3:30 in the morning. The pager went off, and he jumped out of bed. He started just spinning around in circles, because he wasn’t quite sure what the noise was. His wife let him know that it was, in fact, the fire pager. So, Mark rushed to the scene of the fire. It was a terrible night, with horizontal rain pouring down as flames leapt out of the second story windows of the burning house. Mark saw the homeowner standing with the fire captain. She was barefoot in the rain, watching her house burn. She was pretty upset as she talked to the captain, mainly because her dog was still in the house. Understandably, she was terribly concerned about the fate of her beloved pet. When it was Mark’s turn, the captain called Mark over and asked him to go into the house, too—to get the homeowner a pair of shoes. This was not exactly what Mark was hoping for. They weren’t even in a particularly dangerous part of the house. But, Mark followed orders and went inside and grabbed the shoes. 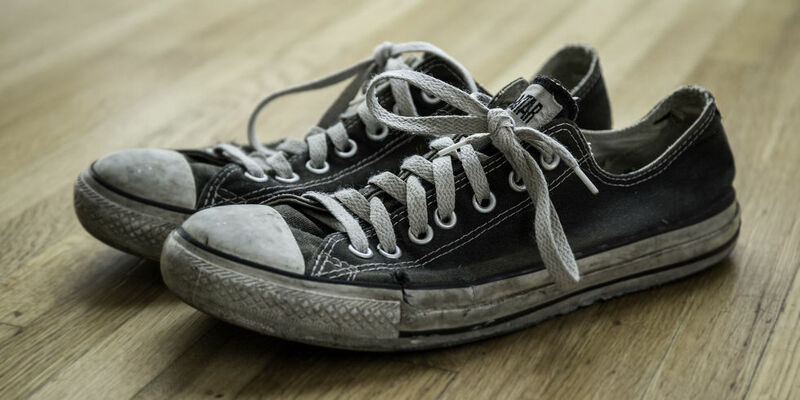 He took them to the homeowner and just handed them over to her, saying, “You might be more comfortable if you put these on.” She was very focused on her rescued dog at that moment, and Mark didn’t know if she had even registered the handoff of the shoes. With the fire under control, Mark headed home, feeling kind of disappointed. He felt like he had gone from hero to zero in nothing flat. A few weeks later, the fire department received a letter from the homeowner. The letter was very effusive, thanking the firefighters for all they had done to save her house and her property and, of course, her dog. And then she made special mention of something that had touched her greatly: someone had even taken the time to go into the burning house and get her a pair of shoes. So often, we are captivated by people whose heroic, larger-than-life stories make a huge difference in the world for hundreds or thousands or even millions of people, or those who rescue one life, if the cost to the rescuer is high. We admire and revere those folks, and we should. After all, Jesus himself said in the Gospel of John, “No one has greater love than this, to lay down one’s life for one’s friends,” and then he did just that. But, we should never let these dramatic events overshadow the fact that Jesus also calls us to action that is less like saving a life than saving the shoes. This is exactly what Jesus is talking about in our passage today. The passage comes at the end of what we know as the “Judgment Discourse,” Jesus’ words to the disciples about the final judgment and the coming of God’s kingdom in all its fullness. In a private conversation with his disciples, just days before his crucifixion, and maybe even as the chief priests and elders gathered together to plot his arrest and murder, he told his disciples how his followers are to live as they wait for that day when the Son of Man comes in all his glory. They are to live each day as faithful servants of God, since the day of judgment will happen without any warning and without any opportunity to make up for what has been left undone. Our passage today is the conclusion of all that Jesus has been leading up to—the time when our lives will be judged. We tend to think of judgment as a bad thing—always a decision in the negative. But what it really is, is more like consideration or discernment. The day of judgment will be a time when our King looks at us and how we’ve lived to discern whether our lives reflected a vital relationship with and sincere faith in Jesus. Our faith is reflected through what we do. Let me be clear: doing stuff, whether big or small, is not what assures us of eternal life. That comes solely as a gift of grace from God through our faith in Jesus. But, as James reminds us, faith that doesn’t result in works is not a living faith at all. True faith leaves evidence behind. That evidence is the work we do as we live out our love of God and neighbor. And often that work takes the form of saving the shoes. These aren’t headline-grabbing, heart-stopping acts of bravery. But when the day of judgment comes, Jesus tells us, he will look lovingly on those who see hunger and, out of their love for him, provide a food pantry in a church basement in a little village in northwest Ohio. He will open his arms to those who collect coats in his name for those who are cold and send greeting cards to those who are lonely. He will smile on those who welcome little children into their lives. And while I’m sure that King Jesus will look favorably on the Mother Teresa’s and the Martin Luther King’s and the Nelson Mandela’s of the world, I’m equally sure that Jesus is the King of the Shoe-savers who provide comfort to those whose houses are on fire. We are surrounded by people whose feet are bare and whose houses are in flames. The physical needs are just the smoke that indicates a bigger fire—a spiritual fire. There are people in this community who are spiritually starving and whose souls are dying of thirst. They are hungry to know God, even if they haven’t figured out that it is God they are yearning for. They are thirsty for the assurance that there is more to life than just putting one foot in front of the other every day—who thirst to know that they are loved, that they are valued, and that their lives mean something. There are people in our community who are sick in spirit and languish in spiritual prisons—prisons of fear and prisons of despair. They feel as vulnerable and defenseless as they would if they were walking around on a frigid winter day with no clothes on. They are sure that no forgiveness can cover the things they’ve done and said in their lives. They are convinced that they’ve made so many mistakes, there is no way they can ever be different. They’ve been disappointed by life over and over again, and they have given up on believing that their lives can ever have any meaning. They’ve pretended for so long that they are something or someone they’re not, that they live imprisoned by the fear that one day their mask will crack and fall, and no one will love the naked person underneath. There are people in our community who feel they are unwelcome strangers in a world where they don’t meet the requirements for inclusion. They feel shut out by their small or non-existent incomes, by jobs that earn no respect in our society, or an address on the wrong side of town. They see doors that are closed to them because they don’t speak the right language, or dress the right way, or worship the right God. They see smiles fade away when their history of addiction or jail time is revealed, and they see hands withdrawn because of where they come from, or what they look like, or whom they love. And, we shouldn’t deceive ourselves into thinking that all these people are walking around outside our doors. Jesus would have no problem identifying those of us who are sitting shoeless, right here in these pews, while our houses are going up in flames. Some we know of. Others of us have fires smoldering behind closed doors where they can’t be seen. But there are barefoot people watching their houses burn from inside the walls of the church as well as on the outside. The good news is that this is also a place full of shoe-saving firefighters. We are already in shoe-saving mode, with the food pantry and TAP and all the projects the mission committee leads us in. Those projects fight the fires that are visible. But we can also offer aid to people whose spiritual houses are on fire. We have stories to tell people about how Jesus feeds us and quenches our thirst when we long to be known and understood and loved. We can tell people how Jesus’ love for us released us from our own prisons and relieved our feelings of being alone. We can share with barefoot others how, when we were sick in body or spirit or both, Jesus was with us offering comfort and strength and companionship. There may come a time when we have the opportunity to do something big—something that will transform the lives of many, something that will change the systems that fuel the fires and keep them going: racism and sexism, poverty and violence, hunger and disease, bigotry and hatred of all kinds. When and if that time comes, I pray that we will be bold and fearless enough to step up to the challenge of saving the world. But it is a certainty that we will have many opportunities to save the shoes. We don’t do this in flamboyant, photo-op ways. We do it over a cup of coffee with someone from exercise class who seems a little down. We do it across the table with a single mom, whose face reveals the stresses of parenting. We do it at work, when a colleague confesses to missing a deadline because of an elderly parent’s illness. We do it at school when a teammate or fellow student is distracted by trouble with family or peers. And we do it at church. Because there are times when we need someone to bring us shoes, too. We may try to hide it, thinking that our times of doubt and trouble betray a weak or non-existent faith. But, there are times for most of us when our faith is stretched thin, when God seems far away, and when the only prayer we can utter is the prayer of the psalmist, “My God, my God, why have you forsaken me?” When we are standing barefoot while our spiritual houses are going up in flames, we need each other to bring us some shoes—to comfort us, to reassure us, to pray for us, and to remind us of the love that surrounds us. We need to hear each other’s testimony just as much as the world outside needs to hear it. This is what Jesus asks us to do for each other and for those we encounter every day. He doesn’t tell us to wait for a 9/11 or a Hurricane Maria or an opioid epidemic and then spring into bold, dramatic action. Instead, he calls us to be shoe-saving firefighters every day. He tells us to love our neighbors through our service and witness, actions which are often unglamorous and may even seem to go unnoticed. He asks us to do the daily work of discipleship—feeding the hungry, giving water to the thirsty, welcoming the stranger, clothing the naked, caring for the sick, and visiting the imprisoned. He calls us to put shoes on the barefoot when their houses are on fire, every day, until the Son of Man comes in all his glory. Amen.